Hey everyone! 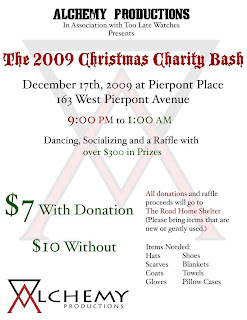 Come on down to Pierpont Place on Thursday, December 17th for Alchemy Productions and Too Late Watches’ Christmas Party – The 2009 Christmas Charity Bash!! Check out the attached flyer – and come celebrate and support The Road Home!!!! Dec 3 – KRCL 30th Anniversary Party!